Today, Chateau Pontet Canet produces what many people call the most popular and in-demand Bordeaux wine of the appellation. Pontet Canet is a powerful Bordeaux wine. It’s concentrated, balanced, tannic and charming as well. The recent success of Pontet Canet is due to the current management of the estate by Alfred Tesseron who is helped by the director, Jean-Michel Comme. Prior to Alfred Tesseron taking control, Chateau Pontet Canet was respected, but it was known equally for its history as well as for its wines. As was the custom of the day, Chateau Pontet Canet found the inspiration for its name from its lineage. The estate took the first part of its name from a former owner, who was also the royal governor of the Medoc, Jean-François de Pontet. Like many owners during the early 18th century, Pontet enlarged his Bordeaux vineyards with purchases of additional Pauillac vineyards. Several years after Pontet’s death, his descendants continued to buy Pauillac vineyard land, including a famous section from the Canet area. Once the combination of his name and the land were put together, this was the birth of the name Chateau Pontet Canet. 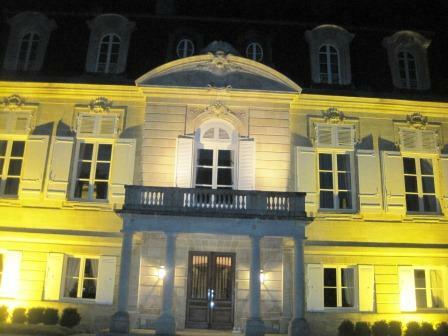 Once the vineyard was fully established, Pontet Canet became and remained one of the largest Bordeaux wine producing estates in the entire appellation. Cruse purchased the estate in 1865. 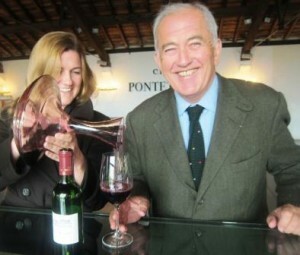 The Cruse family owned Pontet-Canet for 110 years, until another negociant, Guy Tesseron, acquired it in 1975. At the time of the purchase in 1975 by the Tesseron family, the vineyard was in poor condition, needing a lot of replanting. Guy Terrerson was more involved in Cognac, even though the Tesseron family was already experienced in Bordeaux, as they owned Chateau Lafon Rochet in St. Estephe. 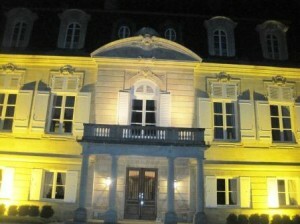 In fact, Chateau Pontet Canet has only belonged to three families in over two centuries. That is quite a rarity in Bordeaux! Since Alfred Tesseron took over running the estate in 1994, the property has continued to improve year after year. Even though Pontet is only a Fifth Growth, they are producing wines at the level of the best Second Growths and in some vintages, as good as the Firsts. Based on the current prices for the wines of Pontet Canet, the market agrees. Situated next to Mouton Rothschild, Tesseron has inspired others on both banks to work more organically as well as consider biodynamic farming. To illustrate this point, in 2010, Chateau Pontet Canet became the first major Bordeaux wine producer to earn the official Agence Bio (AB) organic certification. While the label will not mention this achievement, according to Alfred Tesseron, it is a fact. Organic certification was awarded by Ecocert. The biodynamic certification comes from biodyvin. Alfred Tesseron has an interesting, philosophical look at what they are doing at Chateau Pontet Canet today. In an interview we conducted, when asked how he saw himself, Tesseron responded, “I am not a winemaker. My team members are not winemakers either. As most of the work is done in the vineyards, we are growers. Our success and achievements at Pontet Canet are due to our efforts in the vineyards, not the wine making. At the end of the day, our goal is to produce unique vintages of Pontet Canet that are for drinking, not just for wine tasting”. That is a very apt description for Alfred Tesseron who at one point, desired to be a farmer, even though he earned a degree in oenology. When you think about it, Alfred Tesseron accomplished his goal, as he is a grape farmer. In January 2016, Alfred Tesseron and his niece Melanie Tesseron expanded their vineyard holdings with the purchase of the massive estate of the late comedian, Robin Williams in Napa Valley. Tesseron Family buys Napa Valley Vineyard The Tesseron officially renamed the property, Pym-Rae. Once Alfred Tesseron began moving Chateau Pontet Canet to sustainable farming techniques, he also began to tend the vineyard and vinify the wines on a parcel by parcel basis. In 1999, they hired Michel Rolland as their consultant. The goal of Alfred Tesseron and Chateau Pontet Canet is for to do as little intervention as possible. With that in mind, at Chateau Pontet Canet, they eventually shifted to biodynamic farming, a process Tesseron began to institute at Pontet Canet in 2004. At first, they started with just the Merlot on a trial basis. The results were so good, they went fully biodynamic in 2005! 2007 was the last vintage where chemicals were used. Alfred Tesseron and Jean-Michel Comme, who started with Pontet Canet in 1989, are in many ways keepers of the non interventionist flame. A walk through their vineyards show vines looking a bit on the wild side. Instead of traditional green harvesting, hedging and leaf thinning, they prefer to reduce the number of buds per vines by pruning. The thought process at Pontet Canet is, as the vineyard and soils are healthy, they can protect the vines against disease naturally. Yields are below average at Pontet Canet. Generally speaking the yields at Pontet Canet are less than 35 hectoliters per hectare in most vintages. Alfred Tesseron uses horses in the vineyards of Pontet Canet. The horses walk in the vineyards turning over the soil. The logic is, because the horses never step in the same place twice, they are always aerating the soils in different parts, which is the opposite of what takes place when using tractors, which only move in the same allotted spaces. This simple act adds additional much needed oxygen to the soil. According to Alfred Tesseron, the horses are more gentle when they churn the soil, and because they are lighter than tractors, they also pose less problems for the vines as they are perforce, much gentler on the soil. Currently, the horses work 34 hectares of their vines. It is the goal of Pontet Canet to eventually work the entire vineyard with horses. Part of the problem with going that route when they initially stated using horses was the lack of enough room for more stables. With new stables being constructed, you can expect to see up to 20 horses at Pontet Canet, with the new stables. The horses are Postier Breton’s. The horses are actually gentle giants that enjoy eating the grapes when they work the soils. The first five horses to work the vineyard at Pontet Canet were named; Reine, Surprise, Turbo, Ulysses and Universe. Pontet Canet continues to expand their use of horses, hoping to eventually farm the entire vineyard with horses. Not only do they have horses, but there are also 3 cows and donkeys that live on the estate and help create their unique micro environment and terroir. Since Chateau Pontet Canet began using horses in parts of their vineyards, other estates began following suit, including Chateau Latour in Pauillac, Chateau Margaux in the Left Bank and across the river to the other side of Bordeaux at Chateau Clinet in Pomerol. There are of course more examples as well. In keeping with this spirit, fertilizers are organic and only used on plots that require extra nutrition. Pruning is done in winter. Each individual vine is considered separately and treated accordingly. All these efforts result in grapes that are evenly distributed, with good ventilation, maximum sun exposure, and improved ripeness. Starting with the 2017 vintage, all the grapes are now destemmed by hand. Doing this by hand meshes with Chateau Pontet Canet’s continued their efforts to reduce their environmental footprint. To this effect, they continue striving to eliminate the need for electrical usage in their cellars. Now, you find almost no wall sockets for electricity. This alters how the wine vinified as they no longer do pump overs, because there is no machinery. Lighting is now powered by geothermal energy that emanates from geothermal boreholes that were recently dug into their vineyards. The process works by using a polyethylene pipe to circulate water from and to geothermal heat pumps, simultaneously reducing their ecological thumbprint and removing any effects that electromagnetism might have on the wine. The 81 hectare vineyard of Pontet Canet is planted to 62% Cabernet Sauvignon, 32% Merlot, 4% Cabernet Franc and 2% Petit Verdot. This represents a small shift in the vineyard to more Cabernet Sauvignon that took place in 2009. The vineyard has a terroir terroir of deep gravel with clay and limestone soils. The vineyard of Chateau Pontet Canet is almost one large block of vines that can be divided into two main parcels. Each of those parcels are quite different as you find more Cabernet Sauvignon planted closer to the chateau, not far from Mouton Rothschild. The other parcel features more Merlot and is located closer to the river. Those 2 large vineyard parcels can be further subdivided into 92 separate blocks. Located just across the street and just slightly south from Chateau Mouton Rothschild, Chateau Lafite Rothschild and Chateau dArmailhac, they have nice neighbors indeed! On average, the vines are close to 45 years of age. The vineyard is planted to a vine density of 9,500 vines per hectare. 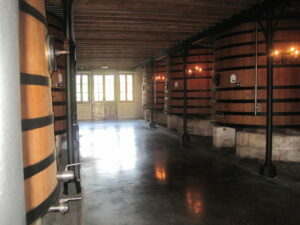 While many chateaux welcome new technology, at Pontet Canet, Alfred Tesseron moves in the opposite direction. His mantra remains firmly in the “everything is done by hand” department. Pontet Canet utilizes no computers to make harvesting or fermentation decisions. Tesseron, along with the important help and advice of Jean-Michel Comme who has been a significant part of Chateau Pontet Canet since 1989. Jean Michel Comme knows every inch and vine in the vineyard. It was Jean Michel Comme who helped bring Alfred Tesseron to see the value in biodynamic farming techniques at Pontet Canet. The first experiments with biodynamics at Chateau Pontet Canet began with 14 hectares of vines in 2004. Alfred Tesseron wanted to be more cautious and start with just 2 hectares, but Jean Michel Comme convinced Tesseron to take a huge chance. Two years later, they were up to 24 hectares being farmed using biodynamic farming techniques. Today, they are 100% biodynamic at Pontet Canet. Jean Michel Comme along with Alfred Tesseron have discovered how to find the perfect moment to pick. A large part of that is due to how much time Jean Michel Comme spends walking in the vines. He looks for deeply colored skins, brown stems, and most importantly, no rot. Then if the fruit looks good, he tastes. When the grapes are ripe, he picks. In some vintages, Tesseron explains, he looks at different parcels on a daily basis. “With 2009 as perfect as it was, we only looked things over a few times a week”. Picking dates are not the only decisions being made without technology. Jean Michel Comme and Alfred Tesseron take biodynamics and natural vineyard techniques seriously. In the vineyards, Alfred Tesseron continues to use horses instead of machinery for some of the blocks. The reason is that horses are good for the soil. Tesseron laughed when asked if there were drawbacks and slyly responded, “Yes, the horses eat the grapes”. It’s a good thing they do not drink the wine as well! Currently, Pontet Canet uses horses to plow 34 hectares out the vineyards 81 hectares of vines. It is the goal of the estate that at some point in the future, the majority of Pontet Canet will be plowed by horses. While the original vat house was constructed in the 1800’s, the facilities at Chateau Pontet Canet were completely renovated in 2005. The wine of Pontet Canet is vinified in a combination of 11, 80 hectoliter, conical shaped wood vats and 37, 80 hectoliter, concrete tanks. All the fermentation tanks are situated just beneath the first floor, sorting tables, allowing for the completely destemmed berries to drop into the tanks using gravity. Malolactic fermentation takes place in vat. The wine of Chateau Pontet Canet is aged in an average of 60% new, French oak barrels for between 16 to 20 months. For the 2010 vintage, Tesseron added numerous rows of Nomblot, concrete eggs to his range of vats. These concrete eggs first became popular due to their usage in the Rhone Valley by Michel Chapoutier. In fact, the egg shaped vats are a creation between Michel Chapoutier and the Nomblot company. 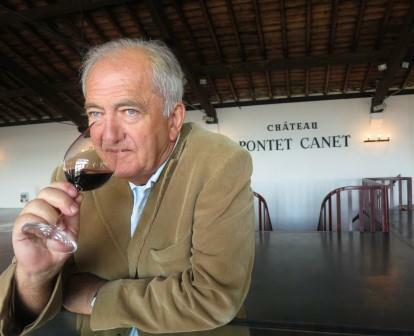 According to Alfred, “Pontet Canet doesn’t perform any computer analysis until the wine is finished. That requires people to work at the cellars, watching the fermentation process, 24 hours a day”. Chateau Pontet experimented with the aging process. Instead of using a combination of new and one year old, French oak barrels, Alfred Tesseron and the technical director, Jean-Michel Comme are trying something different. They are planning on aging up to 25% of the harvest in 900 liter amphorae jars along with between 50% new French oak and 60% new, French oak. Amphorae jars were the most common vessel used to store wine for centuries. Pontet Canet is now also using about 50 amphorae jars. The special jars were produced specifically for use by Chateau Pontet Canet. 25 amphorae jars will be used to age Merlot and the remainder is used for Cabernet Sauvignon. The jars used for the Merlot will be produced from a combination of limestone and cement. 25 additional jars will be used to age the Cabernet Sauvignon. Those amphorae jars will be produced from gravel and cement The gravel and limestone used to create the jars came from the soil of Pontet Canet. The effect on the aging process is not yet known. However, it is thought that the jars would add more minerality to the wines, along with additional soft textures. Plus, as the amphorae jars are porous, they allow for more, limited contact with air, similar to what might occur during micro oxygenation. The best vintages of Chateau Pontet Canet are: 2018, 2017, 2016, 2015, 2014, 2012, 2010, 2009, 2008, 2006, 2005 and 2003. I have tasted older vintages of Pontet Canet back to the 1920’s, and while they can be good, they are not at the same level of quality being produced at the estate today. On average, the estate produces perhaps 25,000 cases of Pontet Canet per year. There is a second wine, Les Hauts de Pontet, which made its debut in 1982. According to Alfred Tesseron, a smaller percentage of his harvest goes into the second wine, Les Hauts de Pontet these days. He prefers to allow the vintage and vineyards to express themselves. 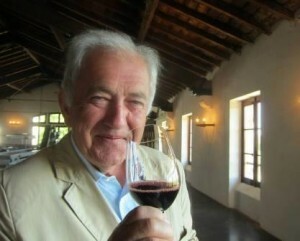 According to Alfred Tesseron, his desire for consumers is to taste each vintage of Pontet Canet as nature intended it. “Because every vintage tells a different story, and we want the wines to taste like the vintage, we do not make a lot of our second wine.” Instead of making more of their second wine, today at Pontet Canet, yields are lower and more wine is simply declassified. In shocking news, the 2012 Les Hauts de Pontet was refused its Pauillac classification and was forced to be labeled as a Vin de France. This ridiculous ruling came out of the yearly blind tasting that all wines sold as Pauillac submit to. While the wine Les Hauts de Pontet is an easy drinking, pleasant experience, and as you would expect, the wine lacks the depth of Pontet Canet, it is a fine example of a light, early drinking Pauillac. Chateau Pontet Canet is not at its best in its youth, even with several hours of decanting. This is due to the high levels of tannins and intense concentration in the wine. The wine is usually better with 10-12-15 years of bottle age. Of course that can vary slightly, depending on the vintage character. In the best years, the wine will best between 15 and 45 years of age after the vintage. Young vintages can be decanted for 2-4 hours. This allows the wine to soften and open its perfume. Older vintages might need very little decanting, just enough to remove the sediment. Chateau Pontet Canet is best served at 15.5 degrees Celsius, 60 degrees Fahrenheit. The cool, almost cellar temperature gives the wine more freshness and lift. Chateau Pontet Canet is best paired with all types of classic meat dishes, veal, pork, beef, lamb, duck, game, roast chicken, roasted, braised and grilled dishes. Chateau Pontet Canet is also good when matched with Asian dishes, rich fish courses like tuna, mushrooms and pasta. The same technical team, that produces the wine for Chateau Pontet Canet, headed up by Jean-Michel Comme, is also involved in managing the vineyards and making the wine for an estate located in the Haut Medoc appellation that is managed by the Cordier family, Chateau Senejac. As you might guess, Chateau Senejac, which is a really fine, Bordeaux value wine is biodynamically farmed. Jean Michel Comme also owns his own biodynamically farmed vineyard, Champ des Treilles in the Sainte Foy appellation. Dark ruby in color, there is a sensation of crushed rocks, lead pencil, flowers and deep, red fruits. The wine is medium/full bodied, soft, polished and stylish. Not the deepest vintage produced at Pontet Canet, though instead you'll enjoy a purity of fruit with elegance, lift, length and vibrancy. Power, elegance, refinement, depth, and length are like everything else with this wine in perfect harmony. Floral in nature, the dark cassis, blackberry, tobacco, and wet earth notes in the perfume stand out. But its the purity of the fruit and the elegance in the character that leaves you wanting another sniff, swirl and sip. The silky textured tannins and sweetness in the fruit in the fruit seals the deal! Cassis drenched flowers, lead pencil, clay, spice, blackberry and cigar box aromatics win you over immediately. Purity and freshness, balance and harmony with length and character, this wine sneaks up on you -- it tastes and feels wonderful. The finish keeps going, building in intensity and flavor, moving from red to black fruits, leaving you with red berries, spice and minerality. The tannins are silky, the fruit is sweet and there is more than ample lift here. The wine just does not quit. Produced from blending 62% Cabernet Sauvignon, 32% Merlot, 4% Cabernet Franc and 2% Petit Verdot, the wine is aging in 55% new French oak barrels, 35% in amphora and the remainder of wine in one year old casks. The harvest took place September 28 to October 12. A fabulous wine that has really developed well since it was first placed in barrel. Rich, dense and intense, the wine is deeply colored powerful and refined. The wine will hit the middle and probably the top of my initial score range with ease. Dark ruby in color, the nose offers truffle, tobacco, cassis and black fruits. Concentrated, tannic and full bodied, the wine has depth, tannins to spare, ripe dark fruits, plum, dark chocolate and cassis. Leave this in your cellar to rest for at least a decade before popping a cork, and you're in for a treat! Showing more fruit character than most wines from this difficult vintage, the wine has a nose of blackberry, wet earth and cigar box. Medium/full bodied with plush textures, this balanced wine finishes with plum, licorice and ripe tannins. This would be a good wine in any year, but in 2013, it is remarkable. Interestingly, there is no second wine produced in this vintage. The low yields set a record for the estate as they were only 15% hectoliters per hectare. From a blend 65% Cabernet Sauvignon, 30% Merlot, 4% Cabernet Franc and 1% Petit Verdot. The wine reached 13% alcohol. 92-94 Pts. Dark ruby in hue, primary as you would expect, with a boatload of fresh, ripe blackberries, dark cherries, tobacco, fennel and stone aromas in the nose. The wine is balanced, soft and round, with freshness, slightly powdery tannins and a clean, concentrated, sweet, fresh boysenberry finish. This is already drinkable. So young, but there is so much potential for greatness, you'd have to be blind to miss it! Layer after layer of rich, deep, ripe, plush, round, polished fruits, perfectly ripe tannins and a finish that does not want to quit. The wine is holding back more in reserve than with previous tastings and is probably going to shut down for a bit. When it opens again, this will be a stunner! Deep, dark ruby in color, packed with blackberry, black cherry, vanilla, tobacco, espresso bean, truffle and wet earth aromas, the wine is dense, balanced, rich, ripe, tannic, thick and mouth filling. There are no hard edges and everything is in all the right places. Give this time to develop, soften and add even more weight and complexity and you’ll be happy you waited. Floral, boysenberry, licorice, leaves, cassis, cedar and tobacco scents are in your face. This is powerful, dense and intense. The wine fills your mouth, coats your palate and continues to expand in the finish delivering an amazing tasting experience that you cannot put down without taking another sip. Before you know it, the bottle is empty, which is the true mark of all great wines. Inky in color with deep, purple accents, tobacco, blackberry, licorice, crème de cassis, stone and smoke create the potent aromatics. Powerful, dense, mouth filling, fresh and concentrated, the wine builds in intensity, expands and moves from flavor to flavor in the long finish. This is the mark of all great wines. The wine demands at least a decade or possibly two before everything truly comes into its own. There is nothing out of place. Everything is in all the right places. For my palate and money, this is the best wine made by Alfred Tesseron at Pontet Canet yet. WOW! There is much purity here, this is like eating, perfectly ripe fruit off the tree. The supple-textured berries with their luscious flavors coat your palate with flavor. Yet, the wine is not heavy. Everything is in perfect balance, due to the lift and acidity. Full-bodied, concentrated and with a serious depth of flavor, this is still young, but on the other hand, it is so good, it is not a bad idea to pop a cork in its youth, just to see what all the fuss is about. Else, wait another decade. Either way, this wine rocks! Starting to close down and tighten up, the fruit was less expressive than in previous tastings. There is no doubt about the quality, ripeness, concentration or purity of the fruit. But it's not as much fun to taste today as it was 6 months ago. Pop a cork soon, or wait 5-10 years for the full experience. I am quite positive my score will jump a few points as the wine matures. Closing down, if you want to taste a bottle, I'd pop one sooner than later, else you should wait 7-10 years before it's really showing its stuff. This stunning wine is packed with layer after layer of ripe, mineral driven, fresh, boysenberries, cocoa, earth and black cherries. The tannins are ripe, silky and soft. This is dense, pure, clean, long and intense with a finish that builds in your mouth. Inky in color, coffee, truffle, blackberry jam, cassis, smoke, tobacco and earth make up the perfume. In the mouth, every nook and cranny is coated with fresh, pure, blackberry, cassis, burning mesquite wood and dark berry jam. Thick, rich, intense and powerful, there is not a hard edge to this stunning vintage of Chateau Pontet Canet. Aged in 60% new oak, from a blend of 65% Cabernet Sauvignon, 30% Merlot, 4% Cabernet Franc and 1% Petit Verdot, the unctuous, velvety, intense, pure, finish is expansive and seamless, lasting close to sixty seconds. Rich, full-bodied, deep, intense and loaded to the brim with crème de cassis, tobacco, smoke, wet forest floor and cherry pipe tobacco elements, the wine is mouth-filling, tannic, long, deep and complex. Everything about this is just great. But patience is going to be needed, as this will probably not hit its peak for at least another 5-8 years. Still holding much of what this has to offer in reserve, the wine is tight at the moment. With air and effort, the concentrated waves of ripe, fresh, juicy, blackberry, tobacco and earth make their way to the surface. This is quite nice, with ripe, soft tannins, but it is still primary. Another 7-10 years will add a lot to the wine, and it could deserve a higher score. The wine was made from a blend of 65% Cabernet Sauvignon, 30% Merlot, 4% Cabernet Franc and 1% Petit Verdot. This is not the best time to be popping a cork on this future beauty. It's tight and hard to a lot of pleasure from at the moment. Yet, with that in mind, it's easy to see the high quality of ripe fruit, soft tannins, concentration and intensity. I'd give this at least 6 to 10 years from today before popping a cork. Young, still primary, but delicious, the tannins are polished, the fruit is concentrated, the wine is complex, deep and fresh. This is probably still quite well priced and is worth taking a look at. If this is a precursor to how the 2012 Pontet Canet is going to develop, perhaps 2012 is a vintage worth looking at, as this big, concentrated, full bodied, cassis, blackberry, earth, truffle, smoke and tobacco filled wine is fresh, polished, balanced, rich, long and still quite young. Still deep in color, with an explosion of black and blue fruit, cassis, cedar, coffee, stone, earth, smoke and cigar box aromatics. Powerful, rich, tannic and structured to age, from a blend of 65% Cabernet Sauvignon, 30% Merlot, 4% Cabernet Franc and a drop of Petit Verdot, this luscious and lusty Pauillac demands at least another decade in the cellar. Chateau Pontet Canet produced a stunning achievement for this difficult Bordeaux vintage. Its spicy cassis, black fruit, oak, earth and tobacco aromatics were a pleasure to smell. Full bodied and filled with ripe cassis and round tannins , the wine ends with a soft, clean finish. This is a better wine than Tesseron produced at Pontet Canet in 94, 95, 96, 97, 98, 99, 00, 01 & 02. Still dark, the color has barely moved from its youthful inky hue. Licorice, espresso, smoke, tobacco, truffle, plums, cocoa, and blackberry aromas resonate. Full bodied and packed with deep, ripe, fruit, the tannins still need time to soften and resolve. Yet, it's hard not to like the layers of fleshy, ripe fruit on the palate and in the finish. Powerful, tannic and long, this textbook Pauillac is packed with layers of creme de cassis, tobacco, blackberry, earth and wet forest characteristics. Young, fresh and full bodied, this requires another 5-10 more years before it really begins to sing. But, if you cannot keep your hands of it, I understand. Broad shouldered, big, concentrated, tannic, ripe, black, purple and ruby in color and obviously very young, this fabulous vintage of Pontet Canet is well worth buying as it can be found for about $90. That's a lot of money, but for a wine of this quality, it's fair. Cassis, blackberry, truffle, tobacco, cedar, coffee and spice scents with air and swirling. Mouth filling, fresh, lively and structgured to age, this voluptuous Pauillac demands at least decade to mature. But if you own a case and want to try a bottle, it's well worth popping a bottle to see and enjoy how this keeps filling out and developing. Deeply colored, the nose was slightly muted, but with coaxing scents of cassis, oak and chocolate could be discovered. In the mouth, you get a big juicy bite of ripe, fresh Cabernet. The wine offers good length with ample tannin and structure to age. 2005 Pontet Canet is rich and remains deeply colored. The tannins are soft and the firmness if youth is being replaced with more elegance. Notes of tobacco leaf, cigar box, earth and dark chocolate ride along with the fresh, blackberry and cassis. 2 hours of decanting worked its magic. But if you can wait until 2025, you’re going to have an even better experience. Full bodied and intense, this mouth filling, luscious treat is packed with layer after layer of rich, dark, dense, perfectly ripe fruits, soft, refined tannins and the stuffing and structure to age and evolve for decades. You can drink it now, but I’m waiting another 5 years before I start popping corks. Truly a blockbuster wine. This is equal parts concentration and personality in this beauty. The cassis, coffee and chocolate scented perfume get your attention. The mountain of black fruit sliding from the glass over your palate is a treat. There is a lot to like about this wine and while prices have risen, for a wine this good, it's still a bargain. Opaque in color with an intoxicating perfume of spicy, black fruit, cassis and oak. Dense and full bodied. Stunning levels of concentration which lead to a great mouthfeel that fills and excites all your taste buds! There is a great freshness and balance to the wine with a finish that lasts close to forty seconds... This is truly a wow wine that is Second Growth in quality! With coaxing, this extremely concentrated, Bordeaux wine started to strut its stuff. Black, purple in color. Very dense and mouthfilling. Huge levels of fruit and body with enough tannin and structure to age for decades. The impressive finish lasted at least fifty seconds! Fresh herbs, cedar, cassis and oak in the nose, the wine is medium bodied, open and finishes with a cassis and olive note in the red berry finish. Deeply colored but without as much concentration as the following vintages. More elegant in style, with a clean black cherry finish. This is the vintage to drink while waiting for the 03, 05 & 06 to come around. I love the early accessibility of the vintage. The wine already shows notes of tobacco, dark, red fruits, forest floor, cigar box and a dab of truffle. The tannins are soft, smooth and feel great, as the ripe, berries lubricate your palate. The blackberry and cassis finish sticks with you adding more earth, smoke and tobacco along the way. The wine was decanted about 45 minutes to 1 hour before serving, which was just fine.2003 is not the vintage of the century. I am not sure who claimed it was. But whoever uttered those words was wrong. But there are several truly great wines from the vintage, most of which come from the Northern Medoc. 2003 is the first vintage in the modern, Tesseron era where the vineyard started to shine. I love this wine. It's a Pauillac of pure pleasure. With a potent nose of cassis, tobacco, boysenberry, hints of blue fruit and a shot of truffle, the wine wants you to get to know it. And you do as soon as it hits your palate with its luxurious textures and sweet, ripe cassis, spice and blackberry. I really like how this is developing. And it should only get better from here. The wine was decanted about 45 minutes to 1 hour before serving. It shows best with some cellar chill left in it. This is really nice juice! With just 30 minutes of air, the wine softened, opened up its earthy, black cherry, cassis and cigar box charms, leaving you with a soft, silky finish. With an hour in the decanter, the wine popped with all its chocolate covered fruits, earth, black cherry, cassis, and cigar box. The wine is lush, full bodied and concentrated. The tannins are soft. Complexity and character are in full force in this one, young Skywalker. The best showing ever for this wine. I am not sure of it was the perfect bottle, flawless cork, or the right amount of decanting, about an hour, but this bottle rocked me! Ruby in color, with blackberry liqueur, cassis, earth, stone, burnt wood and barbecue aromatics never let up. The palate was bathed in luxurious, plush blackberries, boysenberry and dark chocolate, which moves to fresh cassis flavors in the finish. This note is being written after close to 5 hours in the glass and it's still as good or better than the first sip. For a Pauillac of this quality, this is a steal in the marketplace. The first truly outstanding wine produced since Alfred Tesseron took over managing the estate. Soft, smooth tannins pair perfectly with the tobacco, cassis, earth, smoke and blackberry profile, leaving the tasters with the desire for sip after sip of this beauty. Tobacco, earth, smoke, cassis, fennel and blackberry aromas pop with little effort. On the palate, the wine is rich, concentrated, powerful and balanced. There is a softness and polish to the tannins. Unlike many wines from this unique vintage, the wine is maturing at a reasonable pace, which should allow for years of positive evolution. Beautiful, deep ruby in color, 60 minutes in the decanter brought out the tobacco, cassis, chocolate, blackberry, cigar box and earthy, aromatic bouquet display. Concentrated, full bodied, deep and round in the mouth, the long finish is packed with juicy ripe, cassis and mocha. There is little bit of roughness to the otherwise, polished tannins. This is drinking in its adolescent stage on its 10th birthday. Another 3-5 years will add a lot more nuance and complexity. Give it a few more after that and it should reach full maturity. The first great vintage from Alfred Tesseron is the precursor to 2005, 2006, 2008, 2009 and 2010! They are on a roll! With an hour of decanting, tobacco, earth, cassis, blackberries and spice scents were all over the place. Soft, refined and polished tannins and a lush, cassis filled finish can be enjoyed today, or aged for another decade or two. Popped and poured, which was fine. But 30 minutes of air would probably have allowed the wine to open a bit more. Still, there was no denying the beautiful, ripe, clean blast of cassis and blackberries, with earth, tobacco, cigar box and gravel aromatics. Full bodied, rich, ripe, round and concentrated, the wine ends with a long wave of sweet blackberries, cocoa and cassis. You can drink this now, or in 5, 10 or 25 years. It's a delicious expression of 2003 Pauillac. Lush, opulent and already expressive, this forward styled Pontet Canet is filled with tobacco, cassis, earth, forest floor, cedar wood and fresh blackberries. The tannins are ripe and round. With so much glycerin and sweet, ripe, lush fruit, each sip feels great as it crosses your palate. Due to the open style, you can drink this now. However, additional time will add a lot to the experience... that is, if you can keep your hands off this delicious Pauillac for that long! Decanted for two hours and tasted over the next two hours, the perfume offered cassis, licorice, earth, truffle, smoke, black plums, earth, cedar wood and green peppers. Full bodied with voluptuous textures, the wine finishes with a rich, refined, cassis, chocolate and juicy black plum finish. While not mature, this beautiful Pauillac is delivering a lot of pleasure and will only get better over the next several decades. If you have a case and want to see where the first outstanding vintage from Alfred Tesseron is at, you will not be disappointed. This is my best score for this wine yet. Over the next decade, it might even go higher! This vintage from Alfred Tesseron that put Pontet Canet back on the map. Spice, cassis, stone, earth, tobacco, chocolate and truffle scents open to a generous serving of ripe, juicy, blackberry and cassis. Soft tannins and layers of cassis with a touch of olive make this a very enjoyable Pauillac. At 8 years old, this is already starting to drink well. With decanting and coaxing, this full bodied, lush, opulent Bordeaux wine started opening revealing light cassis, blackberry and earthy notes. The palate showed more life with multiple waves of blackberries and cassis. The finish must last at least 40 seconds and every sip keeps you involved. 10 years will add a lot of complexity to this wine... if you can keep your hands off it. Perfectly combining elegance and power with a fleshy exotic, ripe, dark fruit filled personality. Cassis, earth, blackberry, pepper, blue fruit, hints of floral, tobacco and pepper notes make up the perfume. This full bodied wine shows some rustic sensations in mouth as the tannins are not fully ripe. The wine finishes with a big mouthful of cassis. Cedar wood, forest floor, tobacco, blackberry and cassis, this medium/full bodied wine is already close to mature. Slightly rustic in style, there is a hint of cranberry in the cassis filled finish. Perhaps this needs another decade to come around, but in a blind tasting, the wine was tannic, austere and tight. With time and effort, cassis, cigar box and spicy tobacco notes popped into place. But it's not a lot of fun to drink today. If it was my money, skip it and buy the 2003. Ruby with lightening at the edge, truffle, smoke, tobacco and cassis, full bodied, still tannic, with some dryness in the tannins, this classic, structured style of Pontet Canet ends with cassis, fennel and a touch of fresh herbs with blackberry. Tobacco, herbs. cassis, earth and spicy cherry aromas mesh well with the medium bodied, soft textured palate. Slightly on the lean side, with some green in the finish, produced from a blend of 61% Cabernet Sauvignon, 34% Merlot and 5% Cabernet Franc, this is close to fully mature and should be enjoyed sooner than later. Medium-bodied, old school styled wine with rustic tannins on the palate, coupled with alternating sweet and tart, cranberries, tobacco, cedar and forest notes. At 20 years of age, this is, what it is. Future vintages as you know provide much better tasting experiences. Tobacco, earth, smoke and dark berries make up the perfume. The third vintage produced under the supervision of Alfred Tesserson is full bodied and filled with crunchy, chewy Cabernet Sauvignon. In a slightly firm style, this chunky wine ends with cassis and a hint of greenness. The wines being made by Tesseron today bear no resemblance to the earlier, pre 2003 vintages. Cassis, iron, spicy vanilla and blackberry on the nose. Thick palate entry. Powerful. Still some a lot of tannin to resolve. Not very complex, but offering a lot of pleasure for the dollar. In time, this should improve. Ruby with some bricking in color, tobacco, smoke, cassis, coffee and gravel make up the perfume. Structured, traditional, tannic and a on the stern side of the style range, the rustic tannins are a little drying. Time could help soften the wine, but it will always be austere. Inky, purple, ruby with no lightening at the edges. Black currant, coffee, forest aromas. Huge, masculine, tannic, beefy, concentrated, structured wine. Thick, dense, chewy and demands time. At least another 5-10 years. Hard styled, lean and not perfectly ripe, this mightl not improve. If you like this wine, and many people do, it has the stuffing to continue at this level for 15 or more years. Pontet Canet made a huge step up in quality the following year and really turned up the heat starting with 2003! Leather, soy and truffles with dark berries made the perfume. Fully mature, on the palate this rustic, old school styled wine showed a hint of green in the finish. Drink up. The wine starts off with tobacco, stewed fruit, and tea notes. The fruit is not fully ripe and the finish has drying sensations. The wines being produced today at the chateau do not resemble this wine, for they are sublime. Rustic, lean, medium-bodied and four-square, the wine is taking on an acidic, hard, angular character and will continue in that direction, losing more fruit as time marches on. This does not resemble the stunning wines made at the property today. The nose was a bit peculiar as its primary note was cedar, followed by green pepper, more cedar, forest floor, leaf, herbs and a hint of red fruit. Very little tobacco or smoke. The palate started off a bit rough, but with time in the glass, the wine softened and filled out, becoming a better drinking experience. The fruit is light on the palate, focusing more on its texture, cedar and green pepper. Still, it was quite a charmer, in its old school, rustic way as it approaches 60 years of age. 1961 Pontet Canet opens with tobacco, truffle, earth, cassis, gravel, iron and spice box and cedar aromas. With a rustic, but charming personality, the wine finishes with spicy cassis flavors. I with I was young enough to know how the current vintages of Pontet Canet made by Alfred Tesseron will taste when they hit 50 years of age. I imagine they will be stunning! The nose was all spice, leather, earth and truffles. The palate enjoyed a good dose of ripe fruit which had that wonderful old wine texture. Slightly austere in nature, it was a treat to taste this fully mature Pauillac. Truly, a truffle lovers delight. Truffles, earth and more truffles. Did I say truffles yet? Tart, black cherry in the mouth. The style of the wine was a bit austere. Very old school in style abd probably slightly past its prime. Still, the honor of tasting this wine at the Chateau was not lost on me. Ruby with brick tints, this wine did not look 63 years old. Its held up better than Raquel Welch. The perfume as a complicated melange of coconut, smoke, caramel, coffee and tobacco with hints of earth. Very concentrated and still young. Your palated was soothed with a gentle bath of fresh strawberry, cassis, and ripe, black cherry. The sublime wine finished with a compelling sweet, syrupy texture that seemed to remain in your taste receptors for ages. The wine continued improving in the glass for over two hours. This is what great wines are all about. Now, if only I can find some of this magic elixir when I get home. I imagine 05, with its selection and better wine making skills will be this good or better at 60 years of age. I wonder if anyone reading this will be around to find out? Tasted double blind, from a perfectly stored bottle that has not been moved from the chateau since bottling, I was sure this was from the 1950's, because it tasted so young and fresh for its age. Medium bodied, soft and dsplaying the patina of age, the essence of tobacco, cedar, cigar box and fresh cherries, with that beautiful, earthy, wet forest aroma that only comes from serious aging were what this wine is all about. I will probably never see another bottle of this beauty. But I can assure you, I will never forget tasting it! From an original bottle and original cork, this wine was in perfect shape for an 80 year old bottle. Dust red in color, your nose is greeted by light aromas of black fruit, tobacco, earth, forest, spice and leather aromas. Light on the palate, with very soft, black fruit and spice flavors, the wine does not offer a long finish. It trails off a little too quick. The mouth feel is round and opulent, but a little small. Still, it was an honor tasting this wine with my father and so many friends from Bordeaux. The color of bricks and tea, the wine mixed 5 spice, cloves, cedar, tobacco, bright red fruits and leafy notes in the nose palate. There was volume, freshness and vibrancy, along with rustic tannins in the finish.